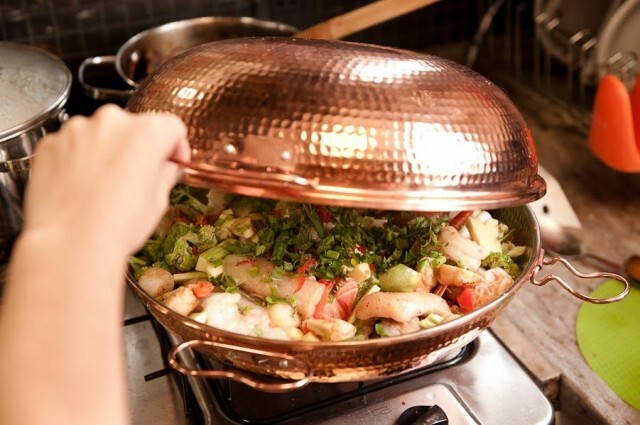 This is the typical “Cataplana Algarvia”, one of the many cataplana dishes in the Algarve. It’s not hard to make at all, but it requires very fresh fish for the best experience. In a cataplana, gather the onions cut to slices and the peppers cut in stripes. Drizzle with olive oil. Add the fish and season with white wine and brandy or cognac and cover it with remaining onions and peppers. Add 2 peeled tomatoes without seeds cut to thin slices followed by the shredded garlic and bay leaf. Add the parsley and garnish with the dry-cured ham, prawns and clams.